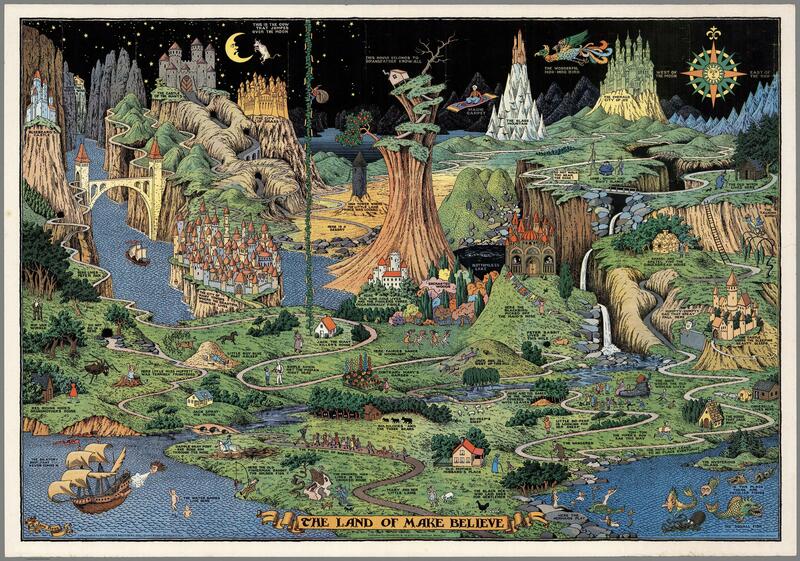 My mom grew up with this “The Land of Make Believe” poster and passed it along to me when I was a toddler. She hung it in my bedroom. I spent my childhood following the fantastic paths, flying on the magic carpet, and wanting to visit the Glass Mountain. When I was 25, I moved to the beautiful coast of British Columbia with a then boyfriend. We lived a rather idyllic life for a short time. He was commuting into Vancouver for work, and I was at home learning how to make paper and soap with a neighbor and taking long woodsy walks with our cat. One of my splurges was to get internet access. Boyfriend didn’t understand why I wanted to communicate with people I didn’t know, halfway around the globe, but he went along with my whim. This was 1996 and my third computer. The world-wide-web was in its infancy. I had the joy of dial-up and Windows 95. My imagination loved this traveling information I found and I planned, and schemed, and dreamt about adventures in other countries. This unknown future pulled me like a strong magnet. Unfortunately, my partner wasn’t so excited about these ideas. I showed him pictures and budgets and tried to spark his adventuresome self, but it wasn’t where he was at the time. My dad visited me from Brooklyn at my forested home in southern Illinois when I was 15 years old. We went for a walk in the beautiful Shawnee National Forest where he recited Robert Frost’s “The Road Not Taken“. The poem obviously had deep meaning to my dad, and because of that, it was important to me. The idea of different paths leading to different lives was intriguing to my young self. Every choice you make in your life takes you down a specific path, each path has infinite branches. One day you take the highway home from work, another day you decide to take city streets home. The time you arrive home is different, the other drivers you encounter are different. That one day where you were looking down at your phone at a stop sign and the guy behind you had to honk for you to look up and cross, might be the day when that guy behind you gets t-boned two miles later because of that pause you took. If you hadn’t been there, he would have driven through that other intersection minutes before the drunk driver arrived. There is no way to know, and it’s useless to ponder that lest it drive you mad staring bug-eyed into the infinite. There are times in one’s life where you know that this particular choice is going to set a path with no backtracking. Those days up on the Sunshine Coast of British Columbia gave me that kind of choice. I stayed with the young man and looked over my shoulder for a while. Eventually, the urge lessened, then faded into a dull hum, and over time to an invisible recurring background process. We moved back to Oakland, then a year later to my hometown in Illinois. That is where our relationship ended. He left back to Oakland, and I moved to Chicago. As I sit here in my new home, with a good corporate job and invisible recurring background process, living the life of a responsible adult, I wonder what life the me is having who left from Canada to parts unknown.